This weekly course is aimed at adults who already has a very Basic knowledge German and would now like to practise and improve in an exclusive and friendly setting. Perhaps you did a few years at school some time ago, perhaps you completed a German course and would now like to practise, perhaps you have lived here for some time and have been meaning to join a German group... now’s the time to do it! 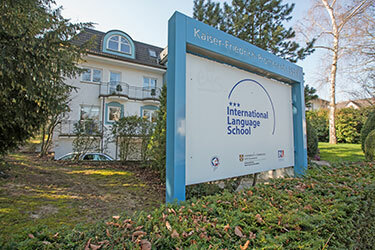 Set in a villa in Bad Homburg, ILSF offer a wonderful platform to learn German in a fun, friendly and practical way while getting to know other like-minded participants joining you on your journey to speaking German. Tuition is given primarily through German although English may be used while discussing cross-cultural topics. This course will focus on practical German for everyday living. The main focus in not on complex grammatical theory or syntax, as highlighted humorously in Mark Twain’s “The Awful German Language”, but rather on practical phrases, vocabulary and useful structures so you can make yourself heard in a range of everyday situations. Problems - when things don’t go according to plan! * Register a friend or colleague too and you get a 10% reduction!